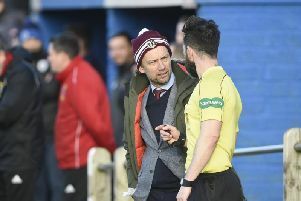 Linlithgow Rose handed out a lesson to student opposition for the second week in succession to stay on course for the Conference C title. 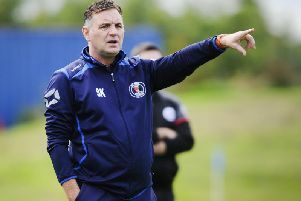 Mark Bradley’s side followed their home win over Heriot Watt with six of the best as they travelled to the University Campus in Bridge of Allan to play Stirling University. The win keeps Rose in second spot, three points behind leaders Broxburn but with a game in hand and a vastly superior goal difference which they boosted further with this win. Rose were again without Blair Batchelor due to work commitments, as well as the injured Iain Gray, so Jamie Mackenzie switched to full back with John Ovenstone in central defence. The Rose took an early lead in the third minute when Owen Ronald’s corner was flicked on by Gary Thom and Tommy Coyne scored from close range. The lead was short lived, however. Just three minutes later the home side equalised when a simple ball forward took out the entire Rose defence and, although Baird’s shot was blocked by Kyle Marley’s legs, Hodges was on hand to net the rebound. But Rose edged ahead again in the ninth minute when another corner from Ronald on the left resulted in a scramble in front of goal and Thom poked the ball over the line. Although the Rose had plenty of possession, it took until the half hour mark for them to really threaten the Stirling goal again, Ross Barbour’s terrific volley flying just inches over the crossbar. A few minutes later, Mckenzie played a fine cross into the box but Coyne couldn’t get the vital touch to turn the ball into the net. In the 38th minute, a Stirling Uni defender headed the ball past his advancing keeper and into the path of Colin Strickland who had no difficulty in slotting home. And four minutes later Coyne controlled a cross from Mackenzie and found the net with a delightful chip from a tight angle to put Rose 4-1 up. Stirling had a chance to claw a goal back on the stroke of half-time, but Corrin headed wide. Rose should have added to their tally just before the hour mark, a great run and cross from Roddy Maclennan put the ball on a plate for Strickland, but somehow the Rose striker sidefooted the ball wide of the target when it seemed he just had to score. Home keeper Donaldson pulled off a fine save in the 75th minute to keep out Thom’s powerful header and a good low strike from Turnbull was deflected out for a corner, from which Coyne’s header crashed off the bar. But Rose kept pushing forward and added two more to their goal tally before the final whistle. Ronald found the net in the 83rd minute when he scored with a deflected shot, and Thom then rounded off the scoring in the final minutes with a powerful header from another Ronald corner for his second and Linlithgow’s sixth goal.